Plasmacytoid dendritic cells (pDCs) recognize microbes, viruses in particular, and provide unique means of innate defense against them. The mechanism of pDC tissue recruitment remained enigmatic because the ligands of CXCR3, the cardinal chemokine receptor on pDCs, have failed to induce in vitro chemotaxis of pDCs in the absence of additional chemokines. In this study, we demonstrate that CXCR3 is sufficient to induce pDC migration, however, by a migratory mechanism that amalgamates the features of haptotaxis and chemorepulsion. To mediate “haptorepulsion” of pDCs, CXCR3 requires the encounter of its cognate ligands immobilized, optimally by heparan sulfate, in a form of a negative gradient. This is the first report of the absolute requirement of chemokine immobilization and presentation for its in vitro promigratory activity. The paradigmatic example of pDC haptorepulsion described here may represent a new pathophysiologically relevant migratory mechanism potentially used by other cells in response to other chemokines. Plasmacytoid dendritic cells (pDCs)3 are professional APCs with the inherent capacity to produce large amounts of natural IFNs (nIFNs). pDCs are activated by viral pathogens which, in contrast, induce “paralysis” or apoptosis of conventional myeloid DCs (1, 2, 3, 4, 5). For example, HSV promotes survival, evokes T cell stimulatory potential, and induces high level nIFN production of pDCs (6, 7, 8). Consequently, pDCs can confer immediate innate protection against viral replication (7). Unlike secondary lymphoid tissues, the noninflamed organs are devoid of pDCs. Thus, pDCs must home to virus-infected tissues to execute the first line innate defense against viral infections and, later, to serve as APCs for the induction of cellular antiviral immunity. However, up to now, the molecular mechanisms of pDC homing into the sites of viral replication remain enigmatic. Functionally different DC precursors have distinctive patterns of chemokine receptor expression which determine their migratory responses. Epitheliotropic DC precursors respond to the CCR6 ligand CCL20 (9, 10), precursors of the dermal/interstitial-type DC lineage respond to CCR1/CCR5 and CCR2 ligands (9, 10, 11), and pDC precursors/immature pDCs express CXCR4 and high levels of CXCR3, a receptor also present on Th1 and CTLs (6, 12, 13, 14). Accordingly, it has been speculated that L-selectin+ pDCs use CXCR3 to access T cell-rich areas of inflamed lymph nodes (6). CXCR3 may also be the receptor guiding pDCs into virus-infected tissue, as its three ligands CXCL9, CXCL10, and CXCL11 are induced by IFN and are released rapidly after virus exposure (15, 16, 17, 18). However, CXCR3 on pDCs apparently does not mediate chemotaxis in vitro (12, 14, 19). This does not reflect an indigenous inability of pDCs to chemotax because CXCL12 can induce migration of these cells. As CXCL12 is a chemokine with constitutive expression in many tissues (9, 20, 21), it is unlikely that it is alone responsible for pDC migration into sites of viral infection. Accordingly, it has been shown that CXCR4-mediated migration of pDCs is enhanced by CXCR3 ligand (CXCR3L) priming (14). This suggests that CXCR3 on pDCs functions solely as an amplifier of CXCR4-mediated chemotaxis. Thus, it is believed that pDCs require the combined presence and action of CXCR3 and of CXCR4 ligands to migrate into infected sites. These conclusions are based on data obtained in Boyden-type chamber assays that measure response to soluble chemokine gradients. It remained unknown whether CXCR3 alone could induce pDC migration in physiologically more relevant systems such as adhesion to and migration across endothelial cells (ECs). In this study, we demonstrate a novel mechanism of CXCR3-dependent pDC migration that does not involve CXCR4-mediated chemotaxis but requires immobilization and presentation of CXCR3Ls. Purified nonlabeled mAbs were anti-CD3, anti-CD11b, anti-CD16, anti-CD19, anti-CD34, anti-CD41, anti-CD56, anti-CD235a (Immunotech, Marseille, France); anti-CCR3, anti-CXCL9, anti-CXCL10, anti-CXCL11, anti-CXCL12 (R&D Systems, McKinley Place, MN); and anti-CD8 and anti-CD45RA (both from BD Biosciences, Mountain View, CA). HECA-452 was kindly provided by Dr. L. Picker (University of Texas Southwestern Medical Center, Dallas, TX). PE-conjugated mAbs were anti-CD123, anti-CXCR1, anti-CXCR2, anti-CXCR4, anti-β7-integrin, anti-CD104 (BD Pharmingen, San Diego, CA), anti-CCR7, anti-CD4, anti-L-selectin (BD Biosciences), anti-CCR2, anti-CCR6, and anti-CXCR5 (R&D Systems). FITC-conjugated mAbs were anti-CCR5, anti-CXCR3 (R&D Systems), and anti-CD45RA (BD Biosciences). Biotinylated anti-CCR1 and anti-CD123 were obtained from R&D Systems and BD Pharmingen, respectively. PerCP-conjugated anti-HLA-DR was obtained from BD Biosciences. HRP-conjugated phosphotyrosine-specific (PY-20) and focal adhesion kinase (FAK) phosphorylation site (Y397)-specific mAbs were obtained from BD Transduction Laboratories (San Jose, CA). Second step Abs included Alexa 488- and tetramethyl isothiocyanate (TRITC)-labeled goat anti-rabbit IgG (Molecular Probes, Leiden, The Netherlands) and TRITC- and Cy5-labeled goat F(ab′)2 anti-mouse IgG (Jackson ImmunoResearch Laboratories, West Grove, PA). Lymphatic vessel-specific anti-podoplanin Abs were generated by repeated immunizations of rabbits with the extracellular domain of human podoplanin expressed in Escherichia coli. Recombinant human chemokines used included CCL2, CCL3, CCL5, CCL7, CCL8, CCL13, CCL17, CCL19, CCL20, CCL22, CXCL8, CXCL11, CX3CL1 (R&D Systems), CCL22, CCL25, CXCL9, CXCL10, and CXCL12 (Strathmann Biotec, Hamburg, Germany). Human rTNFα and rIL-3 were obtained from Strathmann Biotec. IFN-α2b (intron-A) was obtained from Schering-Plough (Kenilworth, NJ). Heparan sulfate (HS) and chondroitin sulfate (CS) were obtained from Sigma-Aldrich (St. Louis, MO) and heparitinase II and chondroitinase ABC from Seikagaku (Tokyo, Japan). Wild-type HSV-2 and influenza virus strain A/Puerto Rico/8/34/H1N1 were kindly provided by Drs. H. Hofmann (Department of Clinical Virology, Medical University of Vienna, Vienna, Austria) and T. Muster (Department of Dermatology, Medical University of Vienna, Vienna, Austria), respectively. Pertussis toxin (PTX) was from Calbiochem (Darmstadt, Germany). pDCs were purified from the peripheral blood of healthy donors essentially as described (22). Briefly, PBMCs were isolated by Ficoll-Hypaque (Pharmacia, La Jolla, CA) density gradient centrifugation and sheep RBC-binding T cells were removed. The resulting cell fraction was then depleted of residual T, B, NK, and hemopoietic stem cells, monocytes, basophils, platelets, and erythrocytes by anti-CD3/CD11b/CD16/CD19/CD34/CD41/CD56/CD235a (2 μg/ml each) immunolabeling and anti-mouse IgG immunomagnetic depletion (MACS; Miltenyi Biotec, Auburn, CA). Sixty to 85% of the remaining cell fraction qualified as pDCs by immunophenotype, i.e., CD123+CD45RA+HLA-DR+CD11c−, as revealed by FACS analysis (FACScan; BD Biosciences). T cells were obtained from the sheep RBC-bound PBMC fraction by hypotonic lysis. Polymorphonuclear neutrophil (PMN) cells were isolated by centrifugation of heparinized blood over a continuous isomolar 70% Percoll gradient (Amersham Biosciences, Arlington Heights, IL) as described previously (23). Human umbilical vein ECs and dermal microvascular ECs (DMECs) were isolated and propagated as described elsewhere (24, 25). Total RNA was isolated from pelleted DMECs and flow-sorted (FACStarPLUS; BD Biosciences) CD123+HLA-DR+CD11c− pDCs (purity >99%) using TriPure reagent according to the manufacturer’s instructions (Roche Diagnostics, Basel, Switzerland). DNase 1 digestion and enzyme inactivation were performed in RNeasy microcolums (Qiagen, Valencia, CA) as recommended. DNA-free DMEC and pDC RNAs were eluted in 20 μl of RNase-free water and cDNA synthesis was conducted in MμlTI Ultra PCR tubes (Sorenson Bioscience, Salt Lake City, UT), each containing 50 mM Tris-HCl, pH 8.3, 75 mM KCl, 3 mM MgCl2, 10 mM DTT, 2 mM of each dNTP, 200 pmol random hexamer (Roche Diagnostics), 20 U of recombinant RNase inhibitor (RNaseOUT; Invitrogen Life Technologies, Carlsbad, CA), 9.5 μl of RNA and 200 U of SuperScript III reverse transcriptase (+RT; Invitrogen Life Technologies) or 1 μl of 87% glycerol as mock RT control (−RT) in a total volume of 20 μl. After incubation for 1 h at 48°C in a thermocycler, 2.5-μl aliquots of each reaction mixture were subjected to PCR using two different primer combinations for specific amplification of CXCR3 splice variants A and B (26). For amplification of a 281-bp fragment of variant A, primer 5′ cxcr3 Aj (5′-ccatggtccttgag/gtgagtgacc-3′) including translation start and spanning the exon1/exon2 junction of the A variant was combined with primer 3′ cxcr3 AB (5′-gagcaggaaggtgtcggtgctgc-3′) recognizing both variants. For amplification of a variant B-specific 449-bp fragment, primer 5′ cxcr3 B (5′-gctgagcggatggagttgaggaag-3′) corresponding to exon 2 of variant B was used in combination with the consensus primer 3′ cxcr3 AB. Fifty-microliter reaction mixtures were prepared in MμlTI Ultra PCR tubes, each containing 10 mM Tris-HCl, pH 8.3, 50 mM KCl, 1.5 mM MgCl2, 1.5 mM of each dNTP, 100 pmol primer 3′ cxcr3 AB, 100 pmol primer 5′ cxcr3 Aj, or 5′ cxcr3 B, 2.5-μl template, and two drops of mineral oil as top layer. After a hot start at 95°C for 5 min and addition of 1.5 U of Taq polymerase/tube, a PCR program consisting of seven touch-down cycles (denaturation at 92°C for 30 s/primer annealing at 72°C-63°C for 45 s (−1.5°C/cycle)/primer elongation at 72°C for 45 s) followed by 38 standard cycles (92°C for 30 s/63°C for 45 s/72°C for 45 s) was conducted in a MiniCycler MJ Research (Biozym, Oldendorf, Germany). Resulting amplification products were visualized on a 1.5% Tris-acetate agarose gel by ethidium bromide staining. pDCs were seeded in 96-well flat-bottom microtiter plates (Costar, Cambridge, MA) in RPMI 1640 supplemented with 10% FCS, 2.5 mM l-glutamine, 100 U/ml penicillin, and 100 μg/ml streptomycin (all from Invitrogen Life Technologies, Rockville, MD). pDCs were cultured in the absence or presence of IL-3 and TNF-α (100 U/ml each), HSV-2 (1 × 106 PFU/ml), influenza virus (strain A/PR-8, 5 hemagglutination units/ml), or IFN-α (100 U/ml) for the indicated time periods. CXCR3-expressing T cells were generated by culture of purified T cells in the presence of IL-2 (100 U/ml) for 14 days as described previously (27). Chemotaxis assays were performed as described previously (9). Briefly, pDCs either freshly isolated or stimulated as indicated were washed and resuspended in migration buffer (HBSS; Invitrogen Life Technologies), 1 mM CaCl2, 0.5 mM MgCl2, 0.1% BSA (Sigma-Aldrich)) at a density of 2–3 × 106 cells/ml. Chemokine solution or buffer alone was added to individual wells of 24-well plates (Costar) on ice before Costar transwell devices (5-μm pore size) were inserted into the wells. Suspended cells were layered on top of the membrane and allowed to migrate for 3 h at 37°C. Transmigrated cells were recovered from the fluid phase of the lower well, stained with anti-CD123-PE, anti-CD45RA-FITC, and anti-HLA-DR PerCP simultaneously, and pDCs were enumerated by FACS analysis as described (9). In a different set of experiments, we assessed migration in response to chemokines immobilized onto transwell filters. Chemokines (1–100 ng/ml) were allowed to bind to the upper, to the lower, or simultaneously to the upper and lower side of HS or CS (both 100 μg/ml)-coated or noncoated filters for 20 min at room temperature. After washing the filter insert, cells were added into the upper well and allowed to migrate for 3 h at 37°C. Then, membranes were cut out, stringently washed with ice-cold PBS, and adherent cells were fixed in ethanol/acetone (1:1) at −20°C for 15 min and stained with anti-CD123-PE (5 μg/ml). Migrated pDCs, i.e., CD123+ cells attached to the lower surface of the transwell membranes, were visualized by laser scanning microscopy ((LSM) LSM 510; Zeiss, Oberkochen, Germany) and enumerated automatically by a previously described algorithm and NIH image software (23). Migration indices were obtained as a ratio of pDCs migrated in the presence of chemokine and pDCs migrated in response to buffer. In addition, pDCs were counted on the upper side of the transwell filters to estimate their adhesion. Adherent pDCs were fixed with 4% paraformaldehyde, permeabilized with 0.1% saponin in PBS/1% BSA, and stained with anti-phospho(p)FAK (1 μg/ml) followed by goat anti-mouse IgG-Alexa488 (2 μg/ml). After quenching in normal mouse serum, cells were incubated with TRITC-coupled phalloidin (5 μg/ml; Sigma-Aldrich) and anti-CD123-biotin (10 μg/ml) followed by streptavidin-Cy5 (1 μg/ml; Molecular Probes). Control stainings were performed with appropriate isotype-matched Abs (2 μg/ml; Sigma-Aldrich). TEM assays were performed as described (23). Briefly, ECs were seeded on the top of a collagen gel (Vitrogen 100; Invitrogen Life Technologies) and cultured to confluence in IMDM (Invitrogen Life Technologies) supplemented with 20% FCS, EC growth supplement (Promo Cell, Heidelberg, Germany), 2.5 mM l-glutamine, 100 U/ml penicillin, and 100 μg/ml streptomycin. After repeated washings with RPMI 1640, EC monolayers were incubated with the indicated chemokine for 10 min at 37°C followed by multiple rounds of washes. pDCs, T cells, or PMN cells were loaded with Cell Tracker Green (Molecular Probes), resuspended in RPMI 1640/5% BSA (106 cells/ml), and seeded on top of the EC monolayer. Cells were then allowed to adhere to and migrate through the EC monolayer for 3 h at 37°C. In chemokine prepulsing experiments, pDCs were incubated with the indicated chemokine (1–100 ng/ml) for 20 min on ice, washed three times, and seeded onto the EC monolayer. Where indicated, pDCs were pretreated with 0.2 μg/ml PTX for 2 h before seeding them onto the EC monolayer. Migration was stopped by fixing the collagen gels with 4% paraformaldehyde and pDCs were visualized by anti-CD123 (5 μg/ml) and anti-mouse IgG-TRITC (2 μg/ml) immunostaining. Adherent and transmigrated cells were identified as Cell Tracker Green+ cells (and CD123+ cells in the case of pDCs) by confocal LSM and were enumerated using NIH image software as described (23). Phosphotyrosine blotting was performed as described previously (28) with modifications. Cell pellets were lysed in 1% Brij97 (Sigma-Aldrich) lysis buffer (10 mM Tris-HCl, pH 7.8, 150 mM NaCl, 20 mM NaF (Sigma-Aldrich), 1 mM Na3VO4 (Calbiochem)) supplemented with a complete protease inhibitor mixture (Roche Diagnostics). After 30 min at 4°C, lysates were centrifuged to remove nuclei at 15,000 × g for 2 min. Supernatants were mixed with an equal volume of 2× reducing sample buffer and boiled for 3 min. Isolated proteins were resolved by gradient (5–12%) SDS-PAGE and blotted onto polyvinylidene difluoride membranes. Membranes were blocked using a buffer containing 1% BSA, 20 mM Tris-HCl, pH 7.4, 150 mM NaCl, 0.1% Tween 20, 0.1 mM Na3VO4 and incubated with HRP-conjugated PY-20 mAb (0.125 μg/ml). Phosphotyrosine-modified proteins were visualized using ECL Western blotting detection reagents (Amersham Biosciences). ECs were detached by trypsin/EDTA (Invitrogen Life Technologies), washed, and incubated with the indicated chemokines (1–1000 ng/ml) for 20 min on ice. After several washes in ice-cold Ca2+/Mg2+-containing PBS, cells were exposed to rabbit anti-CXCL10 or anti-CXCL12 Abs (1 μg/ml each) followed by Alexa 488-labeled anti-rabbit IgG (2 μg/ml). Where indicated, ECs were treated with 25 mU/ml heparitinase II or chondroitinase ABC for 1 h at 37°C, washed three times, and then subjected to the chemokine binding assay. Cell-bound Alexa 488 immunofluorescence was analyzed on a FACScan. All human tissue specimens were obtained upon informed consent. Pieces of normal human skin were taken during elective plastic surgery. Four-millimeter punch biopsies of lesional tissue were obtained from patients affected by HSV-2 or varicella zoster virus. Tonsils were removed in the process of elective tonsillectomy. All samples were snap-frozen in liquid nitrogen-chilled isopentane. Frozen sections were mounted onto glass slides and fixed with acetone at room temperature. For staining, the slides were hydrated and incubated with mouse anti-CXCL9, anti-CXCL10, or anti-CXCL11 mAbs. The bound primary mAbs were detected by sequential incubations with alkaline phosphatase-conjugated rabbit anti-mouse and an alkaline phosphatase-anti-alkaline phosphatase staining kit (DAKO, Carpinteria, CA) according to the manufacturer’s instructions. Isotype-matched control mAbs (DAKO) were used at equimolar concentrations. Each immunostaining protocol was performed on tissue samples from at least three different donors. Five-micrometer cryosections were mounted onto glass slides, air-dried, and then fixed with acetone for 20 min. After drying, slides were hydrated with Ca2+/Mg2+-deficient PBS and exposed to anti-CD45RA or anti-CD8 (1:50 in PBS/1% BSA) for 45 min at room temperature followed by washings and incubation with Cy5-labeled goat F(ab′)2 anti-mouse IgG (5 μg/ml) for 45 min at room temperature. After blocking with 1% mouse serum in PBS/BSA, the sections were exposed sequentially to biotinylated anti-CD123 (10 μg/ml) and streptavidin-Oregon Green (1 μg/ml; Molecular Probes). After several washings, the sections were stained with PE-labeled anti-CD4 (1/50 diluted in PBS/BSA), mounted with Fluoprep (BioMerieux, Marcy l’Etoile, France), and examined by confocal LSM. To detect lymphatic vessels, sections were incubated with rabbit anti-podoplanin antiserum or preimmune serum (final dilution: 1/2000) followed by TRITC-labeled goat F(ab′)2 anti-rabbit IgG. In these experiments, pDCs were simultaneously visualized by anti-CD123 and anti-CD45RA immunostaining. To characterize chemokine receptor expression in tissue cells, double labeling experiments were performed with FITC- or PE-labeled anti-chemokine receptor mAbs and biotinylated anti-CD123 followed by TRITC- or Oregon Green-labeled streptavidin. pDCs, identified as CD123+CD45RA+ cells in lineage Ag-depleted PBMCs, express CXCR3 uniformly and at high levels (Table I⇓). CXCR4 is expressed by pDCs but its expression varies between pDCs from different donors (range: 7–86% positive pDCs; Table I⇓). CCRs 1 through 7 and CXCR1, CXCR2, and CXCR5 are not or are only weakly expressed by blood pDCs. The majority of blood pDCs display substantial amounts of L-selectin which they lose during the process of purification (Table I⇓). In addition, pDCs express high levels of the P-selectin ligand (PSGL)-1 and its fucosylated variant, the cutaneous lymphocyte Ag (CLA; Table I⇓). Furthermore, nearly all pDCs express α4β7 integrin, the receptor for the mucosal addressin cell adhesion molecule. αE, α6, and β4 integrins were not detected on pDCs in significant levels (Table I⇓). Thus, pDCs consistently express one preponderant chemokine receptor, CXCR3, and display the relevant receptors for homing into the skin, the intestine, and secondary lymphoid tissues. We next analyzed isolated pDCs for their ability to migrate to a variety of chemokines in a transwell insert chemotaxis assay. pDCs did not transmigrate through the filters in response to CXCR3Ls irrespective of the chemokine concentration used (Fig. 1⇓) but responded to CXCL12 (Fig. 1⇓A). Conversely, IL-2-activated CXCR3+ T cells were vigorously attracted by soluble CXCL10 gradients (Fig. 1⇓B). pDCs were not significantly attracted by any of the other chemokines tested (Fig. 1⇓A). pDCs matured in vitro in the presence of IL-3 and TNF-α migrated efficaciously to the CCR7 ligand CCL19 but not to CXCR3Ls (Fig. 1⇓B, see below) or to any other chemokines tested (data not shown). These results closely mirror previously published results obtained in Boyden-type chamber assays (12, 13, 14). Soluble CXCL10 gradients do not induce transmigration of pDCs. A, Migration of pDCs to soluble chemokine gradients. The indicated chemokines (100 ng/ml each) were added to the lower chamber of transwells. pDCs were allowed to migrate through 5-μm pore-size filters for 3 h. Migrated pDCs, i.e., CD123+CD45RA+HLA-DR+ cells, were enumerated in the fluid phase of the lower chamber by FACS analysis. Mean migration indices (+SD, n ≥ 5 experiments) are given on the x-axis. 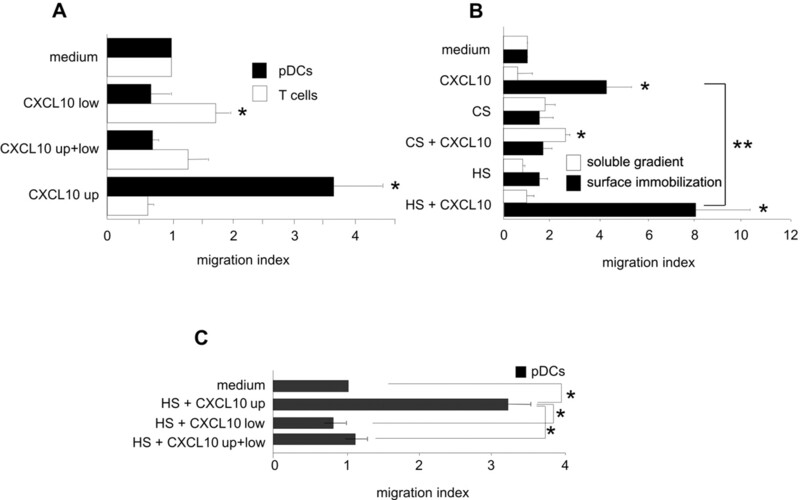 B, T cells but not pDCs migrate to soluble CXCL10 gradients. IL-2-stimulated CXCR3+ T cells (□), immature pDCs (▪), or IL-3/TNF-α-activated pDCs (▦) were allowed to migrate to titrated concentrations of soluble CXCL10 (y-axis, 1–1000 ng/ml). Migration indices obtained in one experiment representative of three are given on the x-axis. We next asked whether the apparent nonresponsiveness of pDCs in Boyden-type chamber assays is due to the expression of a migration-incompetent form of CXCR3. Indeed, recent data indicate that two splice variants of CXCR3, CXCR3A and CXCR3B, exist (26). While CXCR3A mediates chemotaxis, CXCR3B may be involved in transmitting angiostatic signals to ECs. As revealed by a sensitive and splice variant-specific RT-PCR assay, pDCs express CXCR3A but fail to display CXCR3B-encoding RNA (Fig. 2⇓). In contrast, human microvascular ECs are positive for CXCR3B (Fig. 2⇓). This indicates that pDCs are, in principle, equipped with the potential to migrate in response to CXCR3 ligands. pDCs express transcripts coding for the A but not the B form of CXCR3. DNA-free RNA was extracted from FACS-purified pDCs and cultured DMECs. cDNA (+RT) and the corresponding RNA template (−RT) were subjected to CXCR3A- and CXCR3B-specific PCR amplification. pDCs express RNA coding for CXCR3A (281-bp amplicon) selectively while DMECs display CXCR3A and CXCR3B (449-bp amplicon)-specific transcripts. No amplicons were observed when the RT reaction was omitted, excluding the possibility that the non-intron-spanning primer pair for CXCR3B amplification produced positive results due to genomic DNA contamination of the DMEC sample. DNA molecular mass marker (M) and 16-μl aliquots of each reaction were run on agarose gels and visualized by ethidium bromide staining. Positions of marker bands and positions of predicted CXCR3A and CXCR3B amplicons are indicated at the left and right margins, respectively. It has been suggested that immobilized chemokines induce leukocyte adhesion to ECs and consequent TEM in vivo (29). Haptotaxis, i.e., migration along a positive gradient of immobilized chemoattractant, was shown to be the mechanism of neutrophil and monocyte migration (30). To investigate the possible dependency of pDC migration on chemokine immobilization, we precoated 5-μm pore-size transwell filters on the apical, on the basal, or on both the apical and the basal side with CXCL10. The coating conditions used allow for the immobilization of significant levels of chemokine on the selected side of the filter (A. Rot, unpublished observations). Purified pDCs were placed into the upper chamber of the transwells and the cells migrated were enumerated on the basal side of the filter and in the lower chamber. pDCs transmigrated when CXCL10 was immobilized onto the upper side of the filter but no response was observed when the chemokine was immobilized on the lower side or on both sides of the membrane (Fig. 3⇓A). In contrast, CXCL10 immobilized on the basal filter side promoted weak T cell migration (Fig. 3⇓A). No T cell migration was induced when CXCL10 was immobilized on the apical filter side (Fig. 3⇓A). In none of the experimental setups above were pDCs or T cells detected in the fluid phase or adherent to the bottom of the lower chamber (data not shown). Thus, pDCs can sense a negative step gradient of immobilized CXCL10 and migrate in response by a mechanism that entails features of haptotaxis (i.e., dependency on chemokine immobilization) and chemorepulsion (i.e., movement away from highest chemokine concentration). Apically immobilized CXCR3 ligands induce pDC migration. A, CXCL10 immobilized on the upper surface but not CXCL10 immobilized on the lower surface or on both sides of the transwell filter induces pDC transmigration. CXCL10 (100 ng/ml) was coated onto the upper and/or the lower surface of the polycarbonate transwell filter. Then, pDCs or T cells were placed in the upper chamber of the transwell and, after 3 h of incubation, filters were washed stringently. Filter-bound cells were fixed and stained with anti-CD123 and anti-CD3 mAbs for the detection of pDCs and T cells, respectively. Migrated pDCs or T cells on the lower side of the filter were visualized by confocal LSM and enumerated by automatic cell counting. Mean migration indices (+SD) of pDCs (▪) and T cells (□) as obtained in duplicate experiments and counting of 10 microscopic high power fields (HPF) per experimental condition are given on the x-axis. Mean baseline migration of pDCs and of T cells corresponds to 49 and 10 cells/HPF (0.01 mm2), respectively. Results are representative for three independent experiments. ∗, Significant (p < 0.01, Student’s t test) increase in migration as compared with respective medium control. B, HS but not CS enhances CXCL10 immobilization-dependent pDC transmigration. Transwell filters were coated on the upper side with CS or HS (100 μg/ml each), washed, and then pulsed with CXCL10 (100 ng/ml) or left untreated (▪). As a control, CXCL10 (100 ng/ml), CS, HS, (100 μg/ml each), or mixtures thereof were placed into the lower chamber of the transwells in soluble form (□). pDCs were added to the upper chambers of the transwells and pDC migration evaluated as described. Results are representative for three independent experiments. ∗, Significant (p < 0.01) increase in migration as compared with respective medium control; ∗∗, significant (p < 0.01) increase in migration of pDC across HS + CXCL10-coated membranes as compared with pDC migration across CXCL10-coated filters. C, HS/CXCL10 immobilized on the upper surface but not HS/CXCL10 immobilized on the lower surface or on both sides of the transwell filter induces pDC transmigration. HS was coated onto the upper and/or the lower surface of the filter and filters were incubated with CXCL10 at the side of previous HS exposure. pDC transmigration was assessed and data are presented as in A. ∗, Significant (p < 0.01) difference in migration. HS saccharides that decorate various proteins are believed to bind and present chemokines in vivo, in particular, on the apical EC surface (29, 30, 31, 32). To deconstruct such a chemokine presentation setup, the top sides of filters were coated with HS or CS before pulsing them with CXCL10 and measuring pDC migration in response. As shown in Fig. 3⇑B, HS but not CS enhanced CXCL10-mediated pDC migration. 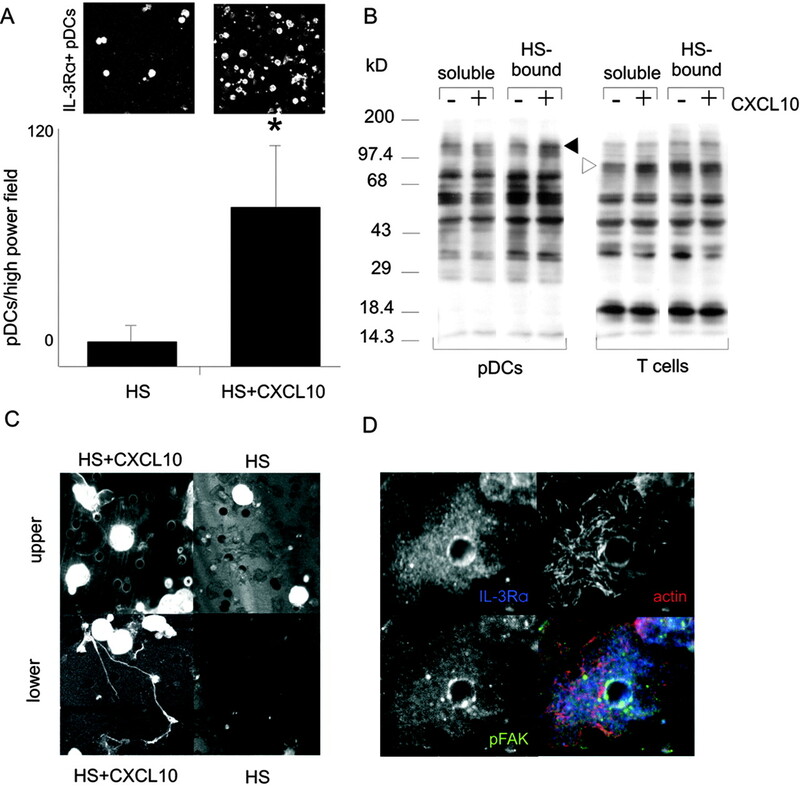 HS-bound CXCL10 more efficaciously induced pDC migration than polycarbonate-bound CXCL10 (Fig. 3⇑B). Binding studies with titrated amounts of radiolabeled CXCL10 showed that, upon exposure to suboptimal chemokine concentrations, the HS-coated filters bound up to 5-fold more chemokine than nonmodified filters (data not shown). For control purposes, HS, CS or mixtures of CXCL10 and HS or CS were placed in soluble form into the lower chamber of the transwells. None of these experimental conditions resulted in migratory responses comparable to those induced by HS-immobilized CXCL10 (Fig. 3⇑B). To see whether pDC migration in response to HS-bound CXCL10 is restricted to apically bound chemokine, HS coating was implemented in an experimental setup analogous to Fig. 3⇑A. As shown in Fig. 3⇑C, pDCs transmigrated when HS/CXCL10 was immobilized onto the upper side of the filter but no response was observed when HS/CXCL10 was immobilized on the lower side or on both sides of the membrane. Thus, CXCL10 immobilized and presented apically in a physiologically relevant fashion is sufficient to induce pDC migration. The following assays were performed to study the outcome of pDC stimulation by immobilized CXCL10. As shown in Fig. 4⇓A, pDCs strongly adhered to HS/CXCL10-bound, but not to HS-coated, membranes. In contrast, exposure of pDCs to soluble CXCL10 did not induce adhesion to the substratum (data not shown). Also, only immobilized but not soluble CXCL10 induced intracellular signaling as evidenced by enhanced tyrosine phosphorylation of several cytosolic pDC proteins with a molecular mass of ∼120–140 kDa (Fig. 4⇓B, left panel). In contrast to pDCs, T cells failed to phosphorylate cellular proteins when exposed to HS-immobilized chemokines (Fig. 4⇓B, right panel). Immobilized CXCL10 induces adhesion, tyrosine phosphorylation, and polarization of pDCs. A, HS-bound CXCL10 mediates pDC adhesion. Transwell filters were coated with HS only or sequentially with HS and CXCL10. pDCs were allowed to adhere to the filters for 20 min, and filter-bound cells were stained with anti-CD123 mAbs and visualized by confocal LSM (upper panels). Mean numbers (+SD) of filter-bound pDCs were assessed by automated cell counting (lower panel, y-axis). ∗, Significant (p < 0.01) increase in adhesion. B, Immobilized but not soluble CXCL10 induces tyrosine phosphorylation in pDCs as assessed by anti-phosphotyrosine Western blotting. pDCs (left panel) or IL-2-stimulated T cells (right panel) were incubated in the absence or presence of soluble CXCL10 (100 ng/ml) or were spun down gently onto HS only or HS/CXCL10-coated filters and cultured for 10 min. Solid arrowhead denotes the position of cellular proteins that are hyperphosphorylated in pDCs in response to immobilized CXCL10. Open arrowhead points to protein bands hyperphosphorylated in T cells in response to soluble but not immobilized CXCL10. C, Morphology of pDCs adhering and transmigrating in response to immobilized CXCL10. Flattening and lamellipodium-like protrusions are seen in pDCs adhering to HS/CXCL10 (upper left panel) but not to HS-coated filters (upper right panel). pDCs migrated to immobilized CXCL10 develop dendrite-like protrusions (lower left panel). No substantial pDC migration was observed on HS-coated filters (lower right panel). Fixed cells were visualized by propidium iodide staining and confocal LSM. D, pDCs cluster pFAK next to the pores of HS/CXCL10-coated filter membranes. Confocal LSM of pDCs adhering to HS/CXCL10-coated filters visualizes the distribution of pFAK (green), F-actin (red), and CD123 (blue; overlay image in lower right panel). The other three panels give the images of the individual fluorescence channels. pDCs that migrated in response to HS-immobilized CXCL10 formed lamellipodia and long “dendrites” that impinge through the pores of the membrane (Fig. 4⇑C, left panels). These morphologic alterations were not seen in the few cells that adhered and migrated spontaneously in the absence of chemokine (Fig. 4⇑C, right panels). Confocal LSM of pDCs during the process of transmigration revealed clustering of phosphorylated FAK (pFAK) as well as of IL-3Rα/CD123 next to the edges of the filter pores (Fig. 4⇑D). As expected, pan-FAK immunostaining also revealed a redistribution of pDC-expressed total FAK toward the edges of the pores and pFAK clustering occurred only when filters were coated with CXCL10/HS but not when the filters were coated with HS only (data not shown). This suggests that pDCs sense the immobilized negative step gradient of CXCL10 in or around the pores and respond by adhesion and migration. Next we investigated whether CXCL10 and CXCL12, the two prototypic chemokines that stimulate pDCs, can bind to ECs in vitro. ECs were pulsed with CXCL10 and CXCL12 and chemokines bound were detected by specific Abs and FACS. While nontreated ECs were devoid of CXCL10 and CXCL12, chemokine pulsing of ECs resulted in the appearance of significant surface immunoreactivity (Fig. 5⇓A). No significant CXCL10 and CXCL12 binding was observed to heparitinase-treated ECs (Fig. 5⇓A). Control chondroitinase treatment did not significantly affect chemokine binding to ECs (data not shown). Moreover, CXCL10 and CXCL12 cross-competed for EC binding (Fig. 5⇓A) indicating that ECs display a limited number of moieties capable of HS-dependent chemokine binding. In binding studies with titrated concentrations of CXCL10 we observed that CXCL10 binding to ECs was saturable and optimal at rather low chemokine concentrations of around 100 ng/ml (Fig. 5⇓B). A similar dose-binding relation was seen with CXCL12 (data not shown). HS-dependent CXCL10 binding to ECs and EC-associated CXCR3 ligands in HSV-infected skin. A, CXCL10 binds to HS moieties on ECs and competes with CXCL12 for EC binding. ECs were either pretreated (middle panels) or not pretreated with heparitinase (top panels, bottom panel) and pulsed with CXCL10 or CXCL12 (100 ng/ml each). Chemokine binding was revealed by sequential incubations with anti-CXCL10 or anti-CXCL12 Abs and Alexa 488-conjugated second step reagents. In the bottom panel, ECs were pretreated with CXCL12 before CXCL10 pulsing and anti-CXCL10 immunostaining. Ab reactivity was measured by FACS (x-axis). Δ Mean fluorescence intensities (MFI) were calculated by subtracting the MFI of nonpulsed ECs from the MFI of chemokine-pulsed ECs (top and middle panels) or by subtracting the MFI of CXCL12 preincubated and CXCL10-pulsed ECs from the MFI of CXCL10-pulsed ECs (bottom panel). B, Dose dependency of CXCL10 binding to ECs. ECs were incubated with the indicated concentrations of CXCL10 and binding was analyzed by FACS. Data are given as mean MFI values (+SD) as obtained in four independent experiments. ∗, Significant (p < 0.05) CXCL10 binding. C, CXCR3 ligands are expressed in HSV-infected skin. Immunohistochemical staining for CXCL9 (upper left panel), CXCL10 (lower left panel), and CXCL11 (upper right panel) of 5-μm cryosections from gluteal herpes lesions reveals expression of all three CXCR3 ligands in the epidermal layers. Moreover, CXCL10 and CXCL11 but not CXCL9 immunoreactivity was found associated with ECs of the dermal vascular plexus (insets in the respective panels). Isotype control mAb staining of HSV lesions (lower right panel) and anti-CXCR3 ligand stainings of unaffected skin (data not shown) revealed no immunoreactivity. To explore whether EC-associated CXCR3Ls can be detected in vivo, we studied HSV-infected skin by immunohistochemistry. All three CXCR3Ls were found to be present in the lesions and were detected in the epidermis most prominently (Fig. 5⇑C). CXCL10 and CXCL11 were further found associated with dermal microvascular ECs (insets of Fig. 5⇑C; lower left panel and upper right panel, respectively). Staining of normal human skin with CXCR3L-specific mAbs and isotype control staining of lesional skin revealed no immunoreactivity (Fig. 5⇑C, data not shown). To further explore the biologic relevance of chemokine presentation-dependent pDC migration, we asked whether EC-bound chemokines can also provide the essential stimulus for pDC transmigration through EC monolayers. Resting and TNF-α-activated EC monolayers grown on collagen gels were pulsed with CXCL10. pDCs were placed apically onto ECs and adhesion and TEM were assessed by multilevel confocal LSM. In accordance with the results obtained in the transwell assays, ECs supported significant CXCL10-dependent adhesion (Fig. 6⇓A) and TEM (Fig. 6⇓B) of pDCs. EC-bound CXCL12 also promoted adhesion (Fig. 6⇓A) and TEM (Fig. 6⇓B) of pDCs, though mostly to a lesser extent than CXCL10. 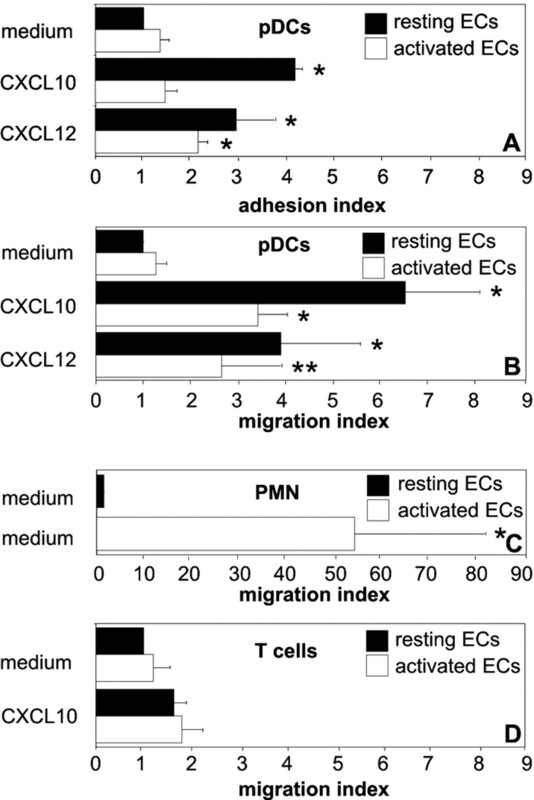 Resting ECs supported pDC adhesion and migration to CXCL10 more potently than activated ECs (Fig. 6⇓, A and B). In the same experiment, selectively activated ECs but not resting ECs promoted the transmigration of PMN (Fig. 6⇓C). In agreement with the results of the transwell experiments, activated T cells showed only inefficient migration through EC monolayers presenting CXCL10 apically (Fig. 6⇓D). pDCs but not T cells transmigrate through CXCL10-presenting EC monolayers. Monolayers of ECs were grown on collagen gels. ECs were cultured in the presence (activated ECs, □) or the absence (resting ECs, ▪) of 100 U/ml TNF-α for 4 h. EC monolayers were washed and pulsed or not pulsed with CXCL10 or CXCL12 (100 ng/ml). A and B, pDCs adhere to and transmigrate across chemokine-pulsed, non-activated EC monolayers. Cell Tracker Green-labeled pDCs were layered on top of the modified or nonmodified ECs and allowed to adhere to (A) and to transmigrate through the EC monolayers (B) for 3 h. Mean baseline adhesion and migration of pDCs correspond to 80 and 11 cells/HPF, respectively. ∗, p < 0.01; ∗∗, p < 0.05 as compared with respective medium controls. C, Granulocytes transmigrate through activated but not through non-activated EC monolayers. Cell Tracker Green-labeled PMN cells were seeded onto and allowed to transmigrate across the EC monolayers for 30 min. Mean baseline migration of granulocytes across resting ECs corresponds to 1 cell/HPF. D, Poor transmigration of T cells through CXCL10-presenting EC monolayers. Cell Tracker Green-labeled IL-2-activated T cells were layered on top of the modified or nonmodified ECs and allowed to transmigrate through the monolayers for 3 h. Adhesion (A) and TEM (B, C, and D) of pDCs (A and B), PMN cells (C), and T cells (D) were measured by assessing the numbers of Cell Tracker Green-labeled cells (and CD123-coexpressing cells in the case of pDCs) on the apical EC surface and within the subendothelial collagen matrix by multilevel confocal LSM and automated cell counting. Results are depicted as mean increase in migration/adhesion (+SD) relative to the migration/adhesion induced by resting, non-chemokine-modified ECs (x-axis). So far we have shown that soluble CXCR3Ls have no promigratory effect on pDCs. We asked whether soluble CXCR3Ls can affect the TEM induced by immobilized chemokines. This is a relevant question because under pathologic conditions CXCR3Ls can be present in the circulation (33, 34). pDCs were pretreated with CXCL9, CXCL10, or CXCL11 before placing them over EC monolayers presenting immobilized CXCL10. Pretreatment with each of the CXCR3Ls abolished the adhesion of pDCs to ECs and their TEM (Fig. 7⇓A). Inhibition of pDC migration was, however, not ligand specific: pretreatment of pDCs with either CXCR3Ls or CXCR4Ls resulted in the inhibition of both their adhesion and migratory responses to either of these ligands immobilized on the EC surface (Fig. 7⇓B). It further appears that the signal transduction required for CXCL10-mediated pDC adhesion and TEM is different. Adhesion is insensitive to PTX (Fig. 7⇓C), while transmigration is abolished by Gi-protein blockade (Fig. 7⇓D). CXCL10 presentation-dependent, Gi-protein-mediated TEM of pDCs is prevented by soluble chemokines. A, Inhibition of CXCL10-mediated EC adhesion and TEM of pDCs by soluble CXCR3 ligands. Nonmodified pDCs or pDCs prepulsed with CXCL10 (1–100 ng/ml), CXCL9, or CXCL11 (100 ng/ml each) were allowed to adhere to and to transmigrate across CXCL10-loaded EC monolayers. Result are expressed as the mean percent inhibition (±SD) of TEM (▪) and adhesion (□). Zero percent (0%) inhibition corresponds to the migration/adhesion of nonpulsed pDCs on CXCL10-loaded ECs. B, Heterologous desensitization of chemokine presentation-dependent EC adhesion and TEM. Nonmodified pDCs or pDCs prepulsed with CXCL10 or CXCL12 (100 ng/ml each) were allowed to adhere to and to transmigrate across CXCL10- or CXCL12-loaded EC monolayers. Result are expressed as the mean percent inhibition (+SD) of TEM (▪) and adhesion (□). Zero percent (0%) inhibition corresponds to the migration/adhesion of nonpulsed pDCs on CXCL10- or CXCL12-loaded ECs. Note that soluble CXCL12 abolishes CXCL10-dependent responses and that CXCL10 as well as CXCL12 prevent CXCL12-dependent adhesion and TEM. C and D, CXCL10 presentation-dependent TEM is Gi protein-mediated while CXCL10 presentation-dependent EC adhesion of pDCs is a Gi protein-independent event. pDCs were exposed (▪) or were not exposed (□) to PTX before layering them onto CXCL10-loaded or non-loaded EC monolayers. Depicted are the adhesion (C) and migration indices (D) of pDCs relative to the adhesion/migration of non-PTX-treated pDCs on non-chemokine-pulsed ECs. Next we investigated whether pDCs infiltrate virus-induced skin eruptions. pDCs can be reliably identified by their CD4+CD45RA+CD123bright immunophenotype (35, 36, 37). We found pDCs localized in perivascular clusters in HSV (Fig. 8⇓, A and B; pDCs appear as whitish and yellow cells, respectively) and in varicella zoster virus-induced skin eruptions (data not shown). 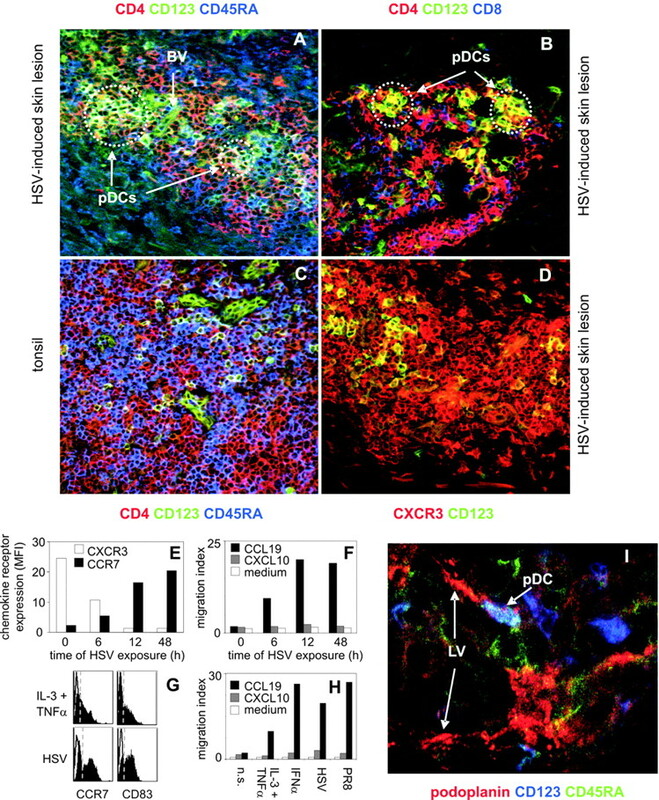 Clusters of pDCs were surrounded by a mixed infiltrate consisting of CD4+ and CD8+ T cells (Fig. 8⇓, A and B). Normal skin did not contain pDCs (not shown). Control staining of tonsils revealed pDCs evenly dispersed in the T cell areas (Fig. 8⇓C). In situ analysis of chemokine receptor expression revealed homogeneous CXCR3 expression in pDCs as well as in the majority of the cells infiltrating HSV-induced lesions (Fig. 8⇓D; pDCs are yellow). Other chemokine receptors (e.g., CCR5, CCR7, CXCR4) were either not detectable or were identified on a minor part of the cellular infiltrate only (data not shown). pDCs accumulate in HSV-induced skin lesions. A and B, Perivascular localization of pDCs in HSV lesions. Cryostat sections obtained from HSV-2-infected gluteal skin were subjected to CD123-Oregon Green (green), CD4-PE (red), and CD45RA-Cy5 (blue; confocal LSM overlay image in A) or to CD123-Oregon Green (green), CD4-PE (red), and CD8-Cy5 (blue) triple immunolabeling (overlay image in B). pDCs, i.e., CD123+CD4+CD45RA+ cells (whitish cells in A) and CD123+CD4+CD8− cells (yellow cells in B), are assembled in small clusters juxtaposed to CD123+ dermal blood vessels (BV, green structures in A and B). CD4+ (red cells in A and B) and CD8+ T cells (blue cells in B) are loosely arranged around the pDC clusters. C, Staining of tonsillar tissue with CD4 (red), CD123 (green), and CD45RA (blue)-specific mAbs. pDCs do not occur in clusters but are equally distributed in the T cell-rich areas. D, Predominance of CXCR3+ cells in the cellular infiltrate of HSV-induced skin lesions. Virtually all CD123+ pDCs express CXCR3 (yellow cells). CD123− cells in the inflammatory infiltrate also express CXCR3 (red cells). E, Rapid reciprocal regulation of CXCR3 and CCR7 expression on pDCs by HSV exposure. Purified pDCs were exposed to HSV-2 (1 × 106 PFU/ml) for the indicated time periods (x-axis) and analyzed for CXCR3 and CCR7 expression by FACS (MFI values, y-axis). F, HSV-induced up-regulation of CCR7 coincides with the rapid induction of pDC chemotaxis to soluble gradients of CCL19. pDCs were cultured for the indicated time period in the presence of HSV-2 and tested for their ability to chemotactically respond to CCL19 or CXCL10 (100 ng/ml each). Migration indices (y-axis) are shown as a function of time of HSV exposure (x-axis). G, HSV is a potent stimulant of pDC maturation. pDCs were cultured in the presence of IL-3/TNF-α (upper panel) or HSV-2 (lower panel) for 12 h and analyzed for the expression of the maturation marker CCR7 and CD83 (closed histograms; left and right panel, respectively). HSV-2 promoted pDC maturation even more potently than the classical maturation mixture IL-3 plus TNF-α. Dashed lines indicate cut-off levels for positive immunofluorescence as revealed by isotype-matched control mAb staining (open histograms). H, HSV, influenza virus, and exogenous IFN-α are equally potent inducers of CCR7-dependent chemotactic activity in pDCs. Freshly isolated pDCs (n.s. ), or pDCs exposed to IL-3 plus TNF-α, IFN-α, HSV-2, or influenza A virus/PR8 strain were tested for their ability to chemotactically respond to CCL19 or CXCL10 in transwell insert chemotaxis assays. Migration indices are given on the y-axis. I, Juxtaposition of pDCs and lymphatic vessels in HSV lesions. Sections were stained with lymphatic vessel (LV)-specific anti-podoplanin Abs (red). pDCs were identified by coexpression of CD45RA (green) and CD123 (blue). To investigate the effects of HSV exposure on the migratory capacity of pDCs, we cultured these cells in the presence of HSV and determined chemokine receptor expression and function. Within 6 h of HSV exposure, pDCs started to lose CXCR3 and to gain CCR7 expression (Fig. 8⇑E). After 12 h, the loss of CXCR3 was complete and the expression of CCR7 was at its peak (Fig. 8⇑, E and G). Consistent with the rapid and massive gain of CCR7 expression, pDCs started to migrate to soluble gradients of CCL19 within 6 h of virus exposure (Fig. 8⇑F). Exposure of pDCs to exogenous IFN-α and to influenza virus down-regulated CXCR3 and induced CCR7 expression and responsiveness to a similar magnitude as seen with HSV (Fig. 8⇑H, data not shown). Thus, the direct contact with different viruses and/or virus-induced nIFNs stimulates the loss of CXCR3 and up-regulation of CCR7-dependent migration. In in situ analyses of HSV-induced lesions, pDCs were occasionally found in close proximity to podoplanin-expressing lymphatic vessels (Fig. 8⇑I). This indicates that HSV-induced CCR7 expression allows pDCs to exit the tissue and to migrate toward regional lymph nodes via CCR7 ligand-expressing lymphatic vessels (25). A successful combat of viral infection requires at least two components: the secretion of virus replication-inhibiting factors such as nIFNs and the induction of virus-specific T cell immunity. pDCs are ideally suited to accomplish both these tasks. To understand their functionality in vivo it is important to learn whether and how pDCs enter virus-infected tissues. This study provides original evidence that CXCR3L immobilization on ECs may be required and sufficient to target pDCs into foci of viral replication. It has been known that CXCR3 is a predominant chemokine receptor expressed on circulating pDCs (Refs. 6 , 12 , 14 ; this study). In functional terms, however, CXCR3 is inactive in inducing chemotaxis of pDCs (Refs. 12 , 14 , 19 ; this study). Recent work emphasizes that CXCR3 functions only as a threshold regulator of CXCR4-driven chemotaxis (14). In this study, however, we show that the CXCR3-CXCR3L interaction is fully competent to induce adhesion and migration of pDCs. These events are evoked only when CXCR3Ls are presented to pDCs in solid phase, a physiologically relevant condition. Glycosaminoglycans, HS, in particular, are crucial for productive presentation of chemokines in vivo (29, 31, 32). Our study shows that CXCR3Ls which are presented by HS on artificial surfaces or the plasma membrane of ECs, but again not the soluble chemokines, can deliver the promigratory signals to pDCs. Intriguing is the observation that migration in response to immobilized CXCR3Ls is a cell type-restricted phenomenon. CXCR3+ T cells, in contrast to pDCs, failed to migrate to CXCR3Ls immobilized on artificial membranes and apical EC surfaces but migrated vigorously to soluble chemokine gradients. This implies that CXCR3 acquires the specific functionality to respond to immobilized chemokines only in the context of the pDC membrane microenvironment. Mechanistically, transmigration of pDCs takes place only to apically immobilized chemokine, signifying the involvement of a negative step gradient. Positive haptotactic CXCR3L gradients as well as chemokines immobilized in a nongradient fashion failed to induce the transmigration of pDCs. Thus, the postulated mechanism of pDC migration includes two mechanistic facets: the migration to immobilized chemokine (haptotaxis) and the movement along a negative chemokine gradient (chemorepulsion). These two migratory mechanisms have been described for other chemokines and other leukocyte types (30, 38, 39). However, until now, in sharp contrast to the pDC response to CXCR3Ls, the chemokine-induced haptotaxis and chemorepulsion were shown to take place separately from each other and only as alternatives to also viable chemotaxis. Remarkably, in the case of CXCR3L-induced pDC migration, “haptorepulsion” is the only possible in vitro mechanism of the observed response. Analogous chemokine immobilization-dependent migration has been described in T cells in response to CXCL12 which, however, also requires lateral shear stress (40). Lateral shear stress is not required for TEM of pDCs. Conceivably, haptorepulsion, as shown for pDCs as a paradigmatic example in this study, may be a novel relevant migratory mechanism used by other cell types in response to different chemokines. CXCL12 is clearly capable of being productively presented by ECs to pDCs in a similar fashion as CXCL10. Thus, our data suggest that CXCR4, besides being a receptor mediating chemotaxis, may be able to execute haptorepulsion in pDCs. Our data also show that CXCR3 and CXCR4 on pDCs can function independently from each other. 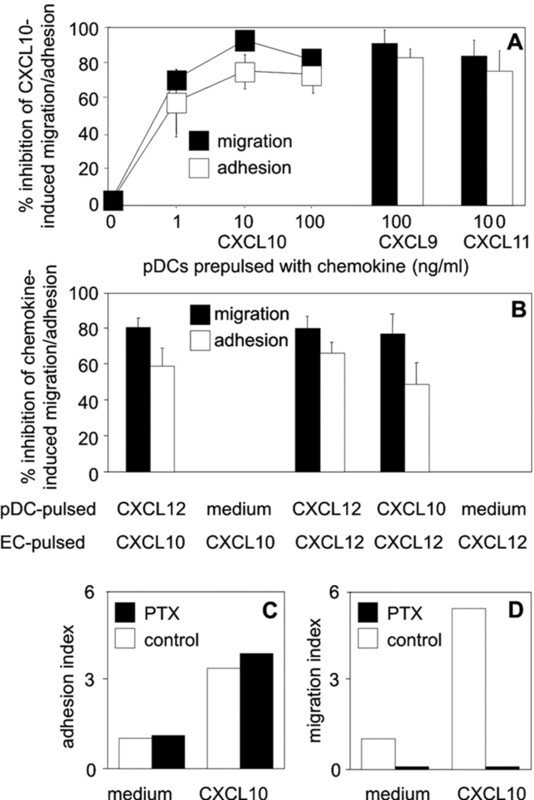 This argument derives from experiments showing that CXCL10 bound to artificial membranes suffices to deliver the migratory signal, that primary ECs that support pDC migration via immobilized CXCL10 lack CXCL12 immunoreactivity, and that blocking anti-CXCR4 mAbs do not interfere with CXCL10-mediated migration across ECs (data not shown). Our data, however, do not exclude the possibility that the two chemokine receptors use a common signal transduction machinery to execute pDC haptorepulsion. In support of the latter stands the observation of heterologous desensitization of CXCR3- and CXCR4-dependent pDC responses by the respective ligands. However, in the scenario of a viral infection, the possible importance of the CXCR4/CXCL12-dependent migration will be diminished due to the appearance of virally induced CXCR3Ls that compete with CXCL12 for EC binding (Fig. 5⇑, A and C). The involvement of CXCR3 in pDC migration into sites of viral replication is further substantiated by the finding that pDCs express the “classical” form of CXCR3 and not its migration-incompetent B variant (26) as revealed by RT-PCR, cDNA cloning, and sequence analysis. Our contention that CXCR3L-binding and presenting moieties exist on ECs derives from the observations that CXCR3Ls are present on ECs in cutaneous sites of viral replication and that CXCR3Ls bind primary ECs in a dose-dependent and saturable fashion. At the first glance, candidate EC receptors include CXCR3B that binds CXCR3Ls with lower affinity than CXCR3A (26). The observations, however, that CXCR3L binding to ECs is HS-dependent and that low concentrations of CXCL12 can inhibit EC CXCR10 binding speak in favor of a previously not recognized CXCR10L-binding structure on ECs. pDCs more efficiently adhered to and migrated across resting than activated EC monolayers. Shedding of the HS-based chemokine binding sites during EC activation could be responsible for this phenomenon (41) but the actual mechanism remains to be determined. More importantly, our data strongly suggest that activation-induced up-regulation of EC adhesion molecules is not required for TEM of pDCs. Granulocytes, in contrast to pDCs, migrated across activated ECs selectively. We speculate that the abundant expression of L-selectin, selectin ligands including CLA and PSGL-1 as well as ligands for intestinal addressins (Refs. 6 , 8 , 14 ; this study) may allow pDCs to roll on resting or on minimally activated ECs and, thus, to constantly screen peripheral sites and lymph nodes for chemokine signatures of viral infection. In this respect, the CXCR3Ls may be of particular significance as they are among the gene products that are extremely rapidly and robustly up-regulated after viral encounter (42, 43). In aggregate, these observations allow for speculation that pDC traffic into virally infected sites is maximal at early time points and may decrease with the onset of overt EC activation and EC activation-dependent recruitment of effector cells of the innate and adaptive immune system. Soluble chemokines exert a negative signal to pDCs that is dominant over the productive proadhesive and migratory signal induced by immobilized chemokines. This suggests a novel therapeutic possibility to prevent pDC homing to peripheral tissues in autoimmune diseases such as lupus erythematosus and functionally related pathologies such as graft rejection (44, 45, 46). To this end, CXC chemokines genetically engineered to preserve their CXCR3-desensitizing capacity but to abolish their EC/HS-binding ability may be used to prevent pDC-mediated tissue damage. Upon HSV exposure, pDCs almost instantaneously down-regulate CXCR3 and up-regulate CCR7 and respond to its ligands chemotactically. Our previous results demonstrated that CCR7Ls are secreted basolaterally by lymphatic ECs (25) and, thus, may be in the position to guide the virus-exposed pDCs into the lymphatic channels. In summary, the two distinctive mechanisms of pDC trafficking, the CXCR3L immobilization-dependent, haptorepulsive migration and the chemotactic gradient-induced departure define consecutive stages of maturation-related pDC functionality. We thank B. Reininger and E. Schwarzinger for excellent technical assistance. ↵1 This work was supported by the CeMM of the Austrian Academy of Sciences, the Austrian Science Foundation (Fonds zur Förderung der Wissenschaftlichen Forschung; Project SFB F018/13), and the Genome Research Programme Austria (GEN-AU) of the Austrian Ministry of Science (to D.M.). ↵3 Abbreviations used in this paper: pDC, plasmacytoid dendritic cell; nIFN, natural IFN; CXCR3L, CXC chemokine receptor 3 ligand; EC, endothelial cell; FAK, focal adhesion kinase; TRITC, tetramethyl isothiocyanate; HS, heparan sulfate; CS, chondroitin sulfate; PTX, pertussis toxin; DMEC, dermal microvascular EC; RT, reverse transcriptase; LSM, laser scanning microscopy; TEM, transendothelial migration; PMN, polymorphonuclear neutrophil; PSGL, P-selectin ligand; CLA, cutaneous lymphocyte Ag; pFAK, phosphorylated FAK. Cella, M., F. Facchetti, A. Lanzavecchia, M. Colonna. 2000. Plasmacytoid dendritic cells activated by influenza virus and CD40L drive a potent TH1 polarization. Nat. Immunol. 1:305. Jones, C. A., M. Fernandez, K. Herc, L. Bosnjak, M. Miranda-Saksena, R. A. Boadle, A. Cunningham. 2003. Herpes simplex virus type 2 induces rapid cell death and functional impairment of murine dendritic cells in vitro. J. Virol. 77:11139. Kobelt, D., M. Lechmann, A. Steinkasserer. 2003. The interaction between dendritic cells and herpes simplex virus-1. Curr. Top. Microbiol. Immunol. 276:145. Kruse, M., O. Rosorius, F. Kratzer, G. Stelz, C. Kuhnt, G. Schuler, J. Hauber, A. Steinkasserer. 2000. Mature dendritic cells infected with herpes simplex virus type 1 exhibit inhibited T-cell stimulatory capacity. J. Virol. 74:7127. Salio, M., M. Cella, M. Suter, A. Lanzavecchia. 1999. Inhibition of dendritic cell maturation by herpes simplex virus. Eur. J. Immunol. 29:3245. Cella, M., D. Jarrossay, F. Facchetti, O. Alebardi, H. Nakajima, A. Lanzavecchia, M. Colonna. 1999. Plasmacytoid monocytes migrate to inflamed lymph nodes and produce large amounts of type I interferon. Nat. Med. 5:919. Siegal, F. P., N. Kadowaki, M. Shodell, P. A. Fitzgerald-Bocarsly, K. Shah, S. Ho, S. Antonenko, Y. J. Liu. 1999. The nature of the principal type 1 interferon-producing cells in human blood. Science 284:1835. Charbonnier, A. S., N. Kohrgruber, E. Kriehuber, G. Stingl, A. Rot, D. Maurer. 1999. Macrophage inflammatory protein 3α is involved in the constitutive trafficking of epidermal Langerhans cells. J. Exp. Med. 190:1755. Dieu-Nosjean, M. C., C. Massacrier, B. Homey, B. Vanbervliet, J. J. Pin, A. Vicari, S. Lebecque, C. Dezutter-Dambuyant, D. Schmitt, A. Zlotnik, C. Caux. 2000. Macrophage inflammatory protein 3α is expressed at inflamed epithelial surfaces and is the most potent chemokine known in attracting Langerhans cell precursors. J. Exp. Med. 192:705. Allavena, P., A. Sica, A. Vecchi, M. Locati, S. Sozzani, A. Mantovani. 2000. The chemokine receptor switch paradigm and dendritic cell migration: its significance in tumor tissues. Immunol. Rev. 177:141. Krug, A., R. Uppaluri, F. Facchetti, B. G. Dorner, K. C. Sheehan, R. D. Schreiber, M. Cella, M. Colonna. 2002. IFN-producing cells respond to CXCR3 ligands in the presence of CXCL12 and secrete inflammatory chemokines upon activation. J. Immunol. 169:6079. Vanbervliet, B., N. Bendriss-Vermare, C. Massacrier, B. Homey, O. De Bouteiller, F. Briere, G. Trinchieri, C. Caux. 2003. The inducible CXCR3 ligands control plasmacytoid dendritic cell responsiveness to the constitutive chemokine stromal cell-derived factor 1 (SDF-1)/CXCL12. J. Exp. Med. 198:823. Borgland, S. L., G. P. Bowen, N. C. Wong, T. A. Libermann, D. A. Muruve. 2000. Adenovirus vector-induced expression of the C-X-C chemokine IP-10 is mediated through capsid-dependent activation of NF-κB. J. Virol. 74:3941. Carr, D. J., J. Chodosh, J. Ash, T. E. Lane. 2003. Effect of anti-CXCL10 monoclonal antibody on herpes simplex virus type 1 keratitis and retinal infection. J. Virol. 77:10037. Sauty, A., M. Dziejman, R. A. Taha, A. S. Iarossi, K. Neote, E. A. Garcia-Zepeda, Q. Hamid, A. D. Luster. 1999. The T cell-specific CXC chemokines IP-10, Mig, and I-TAC are expressed by activated human bronchial epithelial cells. J. Immunol. 162:3549. Tibbles, L. A., J. C. Spurrell, G. P. Bowen, Q. Liu, M. Lam, A. K. Zaiss, S. M. Robbins, M. D. Hollenberg, T. J. Wickham, D. A. Muruve. 2002. Activation of p38 and ERK signaling during adenovirus vector cell entry lead to expression of the C-X-C chemokine IP-10. J. Virol. 76:1559. Penna, G., M. Vulcano, S. Sozzani, L. Adorini. 2002. 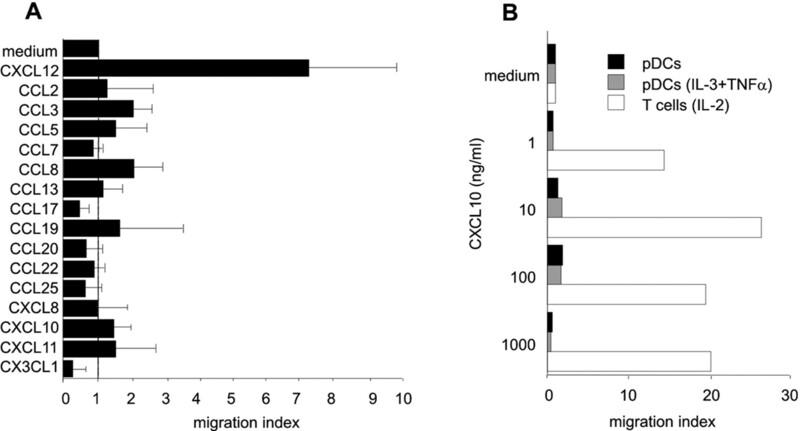 Differential migration behavior and chemokine production by myeloid and plasmacytoid dendritic cells. Hum. Immunol. 63:1164. Bleul, C. C., R. C. Fuhlbrigge, J. M. Casasnovas, A. Aiuti, T. A. Springer. 1996. A highly efficacious lymphocyte chemoattractant, stromal cell-derived factor 1 (SDF-1). J. Exp. Med. 184:1101. Nagasawa, T., T. Nakajima, K. Tachibana, H. Iizasa, C. C. Bleul, O. Yoshie, K. Matsushima, N. Yoshida, T. A. Springer, T. Kishimoto. 1996. Molecular cloning and characterization of a murine pre-B-cell growth-stimulating factor/stromal cell-derived factor 1 receptor, a murine homolog of the human immunodeficiency virus 1 entry coreceptor fusin. Proc. Natl. Acad. Sci. USA 93:14726. Kohrgruber, N., N. Halanek, M. Groger, D. Winter, K. Rappersberger, M. Schmitt-Egenolf, G. Stingl, D. Maurer. 1999. Survival, maturation, and function of CD11c− and CD11c+ peripheral blood dendritic cells are differentially regulated by cytokines. J. Immunol. 163:3250. Gröger, M., T. Matsumura, N. Kohrgruber, D. Maurer, K. Wolff, P. Petzelbauer. 1999. A standardized, a computer-assisted in vitro assay for the assessment of neutrophil transmigration across endothelial monolayers. J. Immunol. Methods 222:101. Petzelbauer, P., C. A. Watson, S. E. Pfau, J. S. Pober. 1995. IL-8 and angiogenesis: evidence that human endothelial cells lack receptors and do not respond to IL-8 in vitro. Cytokine 7:267. Kriehuber, E., S. Breiteneder-Geleff, M. Groeger, A. Soleiman, S. F. Schoppmann, G. Stingl, D. Kerjaschki, D. Maurer. 2001. Isolation and characterization of dermal lymphatic and blood endothelial cells reveal stable and functionally specialized cell lineages. J. Exp. Med. 194:797. Lasagni, L., M. Francalanci, F. Annunziato, E. Lazzeri, S. Giannini, L. Cosmi, C. Sagrinati, B. Mazzinghi, C. Orlando, E. Maggi, et al 2003. An alternatively spliced variant of CXCR3 mediates the inhibition of endothelial cell growth induced by IP-10, Mig, and I-TAC, and acts as functional receptor for platelet factor 4. J. Exp. Med. 197:1537. Cole, K. E., C. A. Strick, T. J. Paradis, K. T. Ogborne, M. Loetscher, R. P. Gladue, W. Lin, J. G. Boyd, B. Moser, D. E. Wood, et al 1998. Interferon-inducible T cell α chemoattractant (I-TAC): a novel non-ELR CXC chemokine with potent activity on activated T cells through selective high affinity binding to CXCR3. J. Exp. Med. 187:2009. Sahuquillo, A. G., A. Roumier, E. Teixeiro, R. Bragado, B. Alarcon. 1998. T cell receptor (TCR) engagement in apoptosis-defective, but interleukin 2 (IL-2)-producing, T cells results in impaired ZAP70/CD3-ζ association. J. Exp. Med. 187:1179. Middleton, J., S. Neil, J. Wintle, I. Clark-Lewis, H. Moore, C. Lam, M. Auer, E. Hub, A. Rot. 1997. Transcytosis and surface presentation of IL-8 by venular endothelial cells. Cell 91:385. Rot, A.. 1993. Neutrophil attractant/activation protein-1 (interleukin-8) induces in vitro neutrophil migration by haptotactic mechanism. Eur. J. Immunol. 23:303. Proudfoot, A. E., T. M. Handel, Z. Johnson, E. K. Lau, P. Li Wang, I. Clark-Lewis, F. Borlat, T. N. Wells, M. H. Kosco-Vilbois. 2003. Glycosaminoglycan binding and oligomerization are essential for the in vivo activity of certain chemokines. Proc. Natl. Acad. Sci. USA 100:1885. Tanaka, Y., D. H. Adams, S. Hubscher, H. Hirano, U. Siebenlist, S. Shaw. 1993. T-cell adhesion induced by proteoglycan-immobilized cytokine MIP-1β. Nature 361:79. Itoh, Y., A. Morita, K. Nishioji, S. Narumi, T. Toyama, Y. Daimon, H. Nakamura, T. Kirishima, T. Okanoue. 2001. Clinical significance of elevated serum interferon-inducible protein-10 levels in hepatitis C virus carriers with persistently normal serum transaminase levels. J. Viral Hepat. 8:341. Juffermans, N. P., A. Verbon, S. J. van Deventer, H. van Deutekom, J. T. Belisle, M. E. Ellis, P. Speelman, T. van der Poll. 1999. Elevated chemokine concentrations in sera of human immunodeficiency virus (HIV)-seropositive and HIV-seronegative patients with tuberculosis: a possible role for mycobacterial lipoarabinomannan. Infect. Immun. 67:4295. Grouard, G., M. C. Rissoan, L. Filgueira, I. Durand, J. Banchereau, Y. J. Liu. 1997. The enigmatic plasmacytoid T cells develop into dendritic cells with interleukin (IL)-3 and CD40-ligand. J. Exp. Med. 185:1101. Jahnsen, F. L., F. Lund-Johansen, J. F. Dunne, L. Farkas, R. Haye, P. Brandtzaeg. 2000. Experimentally induced recruitment of plasmacytoid (CD123high) dendritic cells in human nasal allergy. J. Immunol. 165:4062. Zou, W., V. Machelon, A. Coulomb-L’Hermin, J. Borvak, F. Nome, T. Isaeva, S. Wei, R. Krzysiek, I. Durand-Gasselin, A. Gordon, et al 2001. Stromal-derived factor-1 in human tumors recruits and alters the function of plasmacytoid precursor dendritic cells. Nat. Med. 7:1339. Poznansky, M. C., I. T. Olszak, R. Foxall, R. H. Evans, A. D. Luster, D. T. Scadden. 2000. Active movement of T cells away from a chemokine. Nat. Med. 6:543. Zlatopolskiy, A., J. Laurence. 2001. “Reverse gear” cellular movement mediated by chemokines. Immunol. Cell Biol. 79:340. Cinamon, G., V. Shinder, R. Alon. 2001. Shear forces promote lymphocyte migration across vascular endothelium bearing apical chemokines. Nat. Immunol. 2:515. Platt, J. L., G. M. Vercellotti, B. J. Lindman, T. R. Oegema, Jr, F. H. Bach, A. P. Dalmasso. 1990. Release of heparan sulfate from endothelial cells: implications for pathogenesis of hyperacute rejection. J. Exp. Med. 171:1363. Haberberger, T. C., K. Kupfer, J. E. Murphy. 2000. Profiling of genes which are differentially expressed in mouse liver in response to adenoviral vectors and delivered genes. Gene Ther. 7:903. Reinhart, T. A., B. A. Fallert, M. E. Pfeifer, S. Sanghavi, S. Capuano, III, P. Rajakumar, M. Murphey-Corb, R. Day, C. L. Fuller, T. M. Schaefer. 2002. 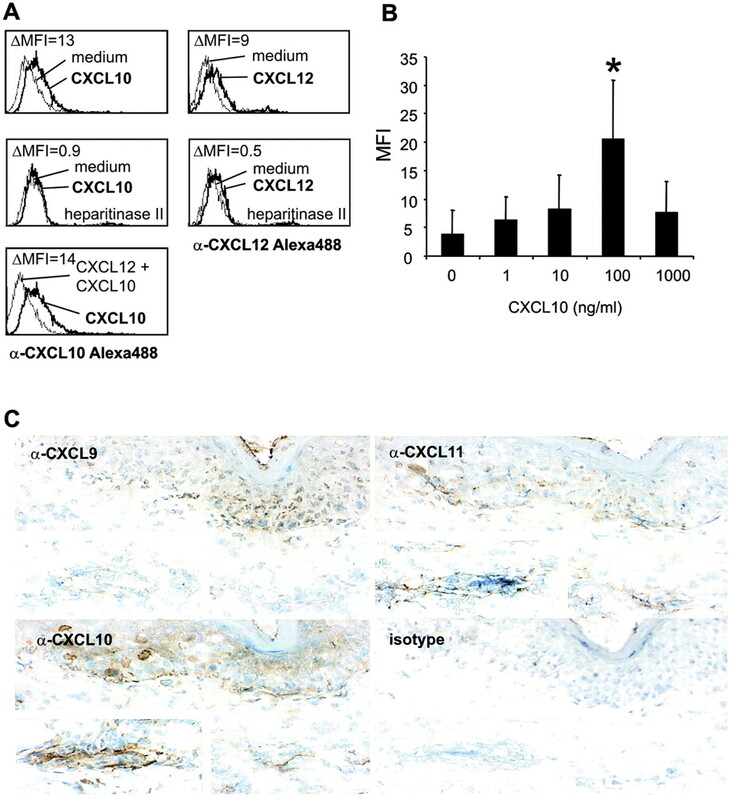 Increased expression of the inflammatory chemokine CXC chemokine ligand 9/monokine induced by interferon-γ in lymphoid tissues of rhesus macaques during simian immunodeficiency virus infection and acquired immunodeficiency syndrome. Blood 99:3119. Farkas, L., K. Beiske, F. Lund-Johansen, P. Brandtzaeg, F. L. Jahnsen. 2001. Plasmacytoid dendritic cells (natural interferon-α/β-producing cells) accumulate in cutaneous lupus erythematosus lesions. Am. J. Pathol. 159:237. Ronnblom, L., G. V. Alm. 2002. The natural interferon-α producing cells in systemic lupus erythematosus. Hum. Immunol. 63:1181.